How to get to "isi" in S.L.? e) click on the 'teleport' link that comes up in the webpage. Now all this is all a REAL HASSLE the first time .... and you are HIGHLY advised, if possible, to have a colleague who already has experience in S.L. to work with you ... peer mentoring is very effective in this situation. invite me in to your school to run sessions on Virtual Worlds, including Second Life ... they have the potential to be an ideal supplement to your school elearning platform. If you are looking for a venue to showcase your products or services internationally in this new cutting edge 3D environment then click on this logo for details. 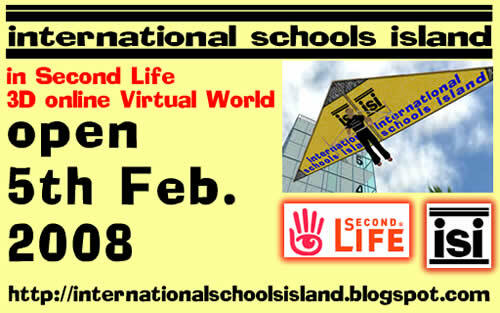 Land is available for rent on the International Schools Island .... for organisations or individuals ... this would be a low cost way of assessing the value of a 3D virtual world for yourself, your school or your organisation. 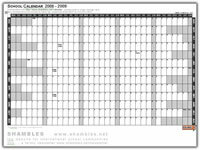 The calendar template that I produce each year is now available for 2008-2009 ... to download free ... it is a Word document and can be edited. An online tool giving (England and Wales) primary schools teachers the ability to tailor learning to the needs of their pupils was launched on 26 April 2007 .... it is now available online. The Interactive Planning Tool lets teachers draw on the extensive resources and guidance currently available on the Primary Framework for literacy and mathematics, which were extensively revised in an e-Framework in October 2006. The tool enables teachers to incorporate this material into their lesson plans and share it with colleagues. It enables you to plan electronically drawing on the framework materials, allowing you to manipulate the Primary Framework content to personalise the learning and teaching in your classroom. TechNews from Becta (UK) Education ... a recommended newsletter for technical support staff and also coordinators. TechNews is a technology, news and analysis service aimed at those in the education sector keen to stay informed about technology developments, trends and issues. "Last year this conference helped to redefine educational conferences around the world. This year we look to take it to a whole new level"
The Conference is open to Governors (Board Members), Heads, and members of Senior Management Teams from British International Schools anywhere in the world. The COBIS Conference has grown substantially in recent years and now attracts people from British schools in Europe, Africa, Asia, Australasia, and America. It provides an excellent forum for meeting senior staff in British schools in Europe and from all over the world, and an opportunity to hear speakers who are leaders in education in the UK. The Open University of Hong Kong (OUHK) and the Hong Kong Web Symposium Consortium are pleased to invite you to participate in the 2008 Conference on ICT in Teaching and Learning on the conference theme of 'Technology-Enriched Learning Spaces'. You are invited to take part in the 2008 series of iNet online conferences for educators: ‘The road to transformation in education’. provides teachers with internationally recognized certification. ISLD (International School Library Day) has been replaced with ISLM (International School Library Month) ... to be in October each year. Back in 2000, Tom Friedman recounts, the world began to shrink and flatten, under the influence of digital interconnectivity. Elaborating on his World is Flat thesis, Friedman describes how this new global order puts creative, entrepreneurial individuals in the driver’s seat, and poses distinct new challenges and opportunities. (48 mins) ... brilliant ! Graeme Littler (graeme_l@harrowschool.ac.th) at Harrow School in Bangkok has set up what is probably the first local Bridge Design/Building Competition for International Schools in Bangkok. "The competition website allows us to monitor easily, without any work on our behalf, who has posted designs and ranks them by cost. If we did elect for a finals day then I would suggest inviting the best team from each school. At the time of writing we potentially have 8 schools involved but I would hope for more participants once word has filtered through the ether..."
The local contest code is - BTC16A and is modeled on the well known "West Point Bridge Design Contest"
For more details contact Graeme directly. MA in Education for teachers currently teaching in British Schools abroad. The District Leader's Podcast provides a forum where district leaders can share their experiences and expertise in a flexible format that works with busy schedules. The podcast episodes showcase interviews with district leaders from around the country. We believe you will find support and insight here because our team of podcast co-hosts are educational experts who have been on the 'front line' either as a former superintendent or as a school board member. The experiences and insights from these educational leaders will be valuable to just about anyone who is interested in improving our schools. In the lead up to the big event on 12th February, organisations and authorities in no less than 50 countries worldwide are caught up in last minute preparations. E-voting is underway over eight thousand of internauts having selected their winners in the Safer Internet Day competition already. This year’s theme “Life online is what YOU make of it” has sparked widespread interest from youngsters and adults the world over and guarantee a more exciting blogathon than ever this year, when it kicks off on 12th February for its 24-hour voyage around the world. In 2007 I set up what I called "A Forest of Theme Blogs that now has over 40 Blogs ... one of the themes is Nursery Rhymes. I was actually disappointed not to be able to find online videos of someone playing the Rhymes on a piano that teachers/students could just follow along with. Well .. the resource is now available ... John Barham, x-Hong Kong music educator has produced a number of small video clips of him (and Howard the Teddy Bear) performing on the ivory keys (ummm I guess 'ivory' would be politically incorrect now .... the plastic keys) ... and they are brilliant. The bad news is that I've not yet had time to optimise them for the web and upload them to the Blog ..... but I plan to over the coming weeks. These should be an excellent resource for teachers of the young and of the very young. England and Wales Schools secretary Ed Balls launched his Children’s Plan just before Christmas, and with it a new government ‘ambition’ that all new school buildings should be carbon neutral by 2016, in line with new homes. He also announced that a taskforce will be set up to advise on the how the target should be achieved, raising the question of whether schools should get their own regulatory ladder for energy performance along the lines of the Code for Sustainable Homes. More information about the carbon reduction programme at http://tinyurl.com/yrhufh where there are also links to a carbon calculator for school design options and new guidance on the use of renewables in schools and evaluation of biomass for heating. I shall be in Singapore again in March running more public sessions on mainly Web 2.0 ... including blogging, podcasting, social networking. Session are being coordinated again by the Singapore company, Synergyst who are also setting up some other events, not just web 2.0 ..
Having a local Singapore coordinator for visits makes it much more cost effective for schools to use my time as some of the expenses are shared. As E.O. Wilson accepts his 2007 TED Prize, he makes a plea on behalf of his constituents, the insects and small creatures, to learn more about our biosphere. We know so little about nature, he says, that we're still discovering tiny organisms indispensable to life; yet we're still steadily destroying nature. Wilson identifies five grave threats to biodiversity (a term he coined), using the acronym HIPPO, and makes his TED wish: that we will work together on the Encyclopedia of Life, a web-based compendium of data from scientists and amateurs on every aspect of the biosphere. "We have over 100 programmes that focus on the teaching of ICT and the whole school issues surrounding new technology and ICT skills. Follow the links to our video browser, and make sure to check out each programme's extra resources." The mission of One Laptop per Child (OLPC) initiative is to empower the children of developing countries to learn by providing one connected laptop to every school-age child. In order to accomplish our goal, we need people who believe in what we’re doing and want to help make education for the world’s children a priority, not a privilege. The celebration of the International Year of the Potato (IYP) will raise awareness of the importance of the potato - and of agriculture in general - in addressing issues of global concern, including hunger, poverty and threats to the environment. The (England and Wales) Government wants to make the country the best place in the world for children and young people to grow up. The Children’s Plan sets out how the Department for Children, Schools and Families is going to achieve that – by putting the needs of families, children and young people at the centre of everything we do. Johnson’s Observation on Multimedia Content: You can put all the pretty clothes on your dog you want, but he’s still a dog. Johnson’s Observation About the Importance of Teacher Quality: I’d rather my children had a great teacher with mediocre technology than a mediocre teacher with great technology.